With the commissioning of the Gaoxin-6, the PLAN’s anti-submarine warfare capabilities receive a major boost. After years of development, China’s Gaoxin-6, a four-engine, fixed-wing, anti-submarine patrol aircraft, was commissioned into the People’s Liberation Army Navy’s (PLAN) North Sea Fleet. The aircraft will be a major boon to the PLAN’s anti-submarine warfare (ASW) capabilities, a neglected area despite China’s broader naval modernization. 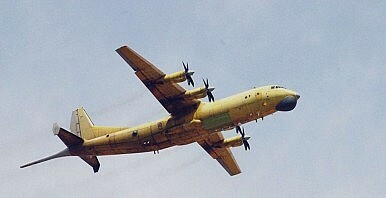 The Gaoxin-6 is, in essence, a heavily modified Shaanxi Y-8 transport aircraft and reports over the years have noted that China’s goal with this aircraft was to emulate the form and function of the United States’ Lockheed P-3C Orion patrol aircraft, the most widely deployed anti-submarine aircraft in the world. The Gaoxin-6’s commissioning, along with China’s growing fleet of anti-submarine corvettes (specifically, the Type 056 Jiangdao-class), marks a milestone in the PLAN’s ASW capabilities. The Gaoxin-6 was developed by Shaanxi Aircraft Industry Corporation. It boasts a 6,000 km range and over eight hours of uninterrupted flight time. The aircraft’s two most notable features that set it apart from other Y-8 variants include its sea-search radar, mounted just under the cockpit, and its rear magnetic anomaly detector. The Gaoxin-6 does feature a bomb bay, but it is unclear precisely how much and what types of ordnance it is capable of delivering. The P-3C, by comparison, can carry 20,000 pounds of ordnance, including Harpoon anti-ship missiles and Maverick air-to-ground missiles. According to China Daily, the Gaoxin-6’s commissioning brings China into a club of five other nations that operate similarly sophisticated anti-submarine warfare ISR aircraft: the United States, Russia, Japan, the UK and France. A long-range anti-submarine ISR capability is critical for the Chinese navy’s blue-water ambitions. Without an ability to detect submarines in unfamiliar waters, the PLAN’s surface vessels would remain immensely vulnerable to hostile submarines. This sort of a monitoring facility, coupled with the Gaoxin-6 in the air and a growing fleet of Type 056 Jiangdao-class corvettes, will leave the PLAN with a considerably more formidable ASW setup than it had a year ago when numerous columns were being written at The Diplomat and elsewhere highlighting this capability gap in the Chinese navy. Regional navies—certainly Vietnam—are looking to offset the threat posted by the PLAN by using an asymmetric deterrence approach. The PLAN already enjoys conventional superiority in the South China Sea with its surface vessels; a robust ASW capability will crystallize this further by decreasing the effectiveness of potentially hostile submarines. In May 2017, China had deployed four Y-8Q (Gaoxin-6) aircraft to Lingshui Air Base in the South China Sea.